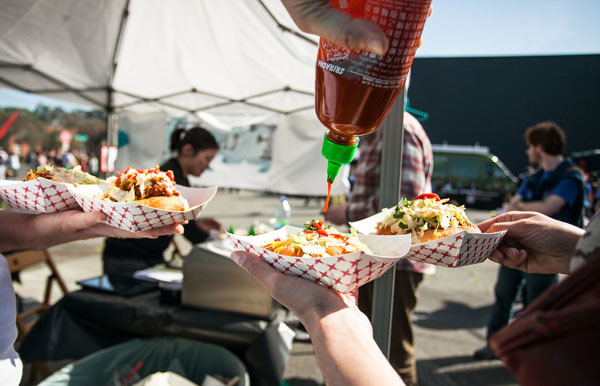 Recently, I read an article about Seattle’s Top 10 Food Trucks and found myself overwhelmed with jealousy. Hawaiian-Korean-Vietnamese-Mexican fusion and “sci-fi/fantasy” grilled cheese? Seriously, count me in. After some quick internet sleuthing to see if Des Moines had any of these wheeled culinary wonders on our streets, all I found was a year-old article bemoaning their absence. 1. Culinary Diversity - Everybody loves “concept” food! Some innovative food ideas might not make it as full-scale restaurants, but can succeed as food trucks. Trends may come and go, but fun and variety will always be around - just like the infamous Iowa State Fair. 2. Spontaneity - Food trucks have the ability to vanish and appear wherever the wind may take them. (And by “the wind”, I may mean “city regulations” and “mealtimes.”) Imagine how awesome it would be to stumble upon your favorite snack foods while on break or while running errands. 3. Increased Walkability - From a pedestrian’s perspective, Des Moines is plagued by endless stretches of straight roads and sidewalks. The addition of food trucks would break up these stretches of walking, and make them much more delicious. 4. Feeding Office Wildebeest... Er, Workers - Downtown Des Moines is home to insurance companies and banks of all kinds. By lunchtime, employees who didn’t pack lunches swarm out of those companies like stampedes of wildebeests looking for a meal. Why not offer these hungry swarms a changing lineup of interesting menu items pre-packaged for portability? 5. Entrepreneurship - Food trucks can be a boon to food enthusiasts trying to get a start in a tough economy. They’ve got lower entrance costs than a full-on restaurant, and many food trucks eventually build up to becoming their own stationary restaurants. Newer:More Delicious Food Pictures: #ChangeNomsOlder:How Will the iPad Mini Change Restaurants and Retail?